(NaturalNews) A newer and much, much cheaper version of the EpiPen could be available as early as next year, according to Mark Baum, owner of San Diego-based Imprimis Pharmaceuticals, which manufactures medical products such as eye drops and sinus medication at more affordable prices. Speaking with CNN Money on Tuesday, Baum said that his company has been working behind the scenes to create a compounded version of the EpiPen for months now. During the interview, Baum revealed that one of the main ingredients in the device can be produced very inexpensively. "[O]ne milligram of epinephrine, which is three times more than what's needed in an EpiPen, costs just a few bucks," reports WCVB-TV, an ABC affiliate located in Boston, Massachusetts. "The cost of epinephrine is literally less than a Big Mac," Baum said regarding the EpiPen's primary ingredient. And the injector needle is just as cheap, costing between $3 and $7. 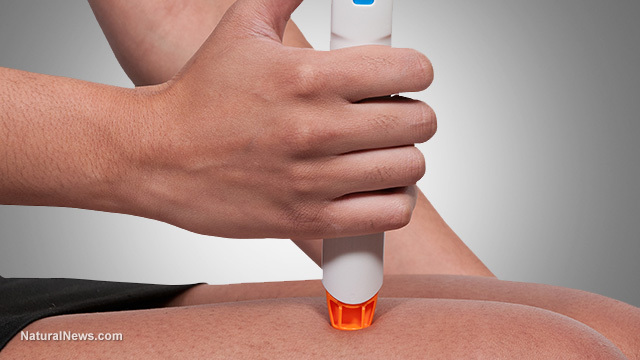 EpiPens are administered to those suffering anaphylactic shock, a condition induced by food allergies. Some of the most common allergies are caused by foods such as peanuts, tree nuts, shellfish, cow's milk and wheat. Baum said he believes his company can produce a customizable version of the EpiPen and market it profitably for less than $100. "We don't have the desire to charge the public even $300, for something that costs so little," he said. "That's not how I want to live my life." His comments come on the heels of recent controversy over the enormous price hikes related to the EpiPen, manufactured by Mylan Pharmaceuticals, which is registered in the Netherlands but headquartered in Canonsburg, Pennsylvania. The cost of the drug, which upon injection constricts blood vessels to increase blood pressure and relax muscles to improve breathing, has increased from $100 to more than $600 in the U.S. EpiPens are particularly expensive considering that they expire after only one to two years. Because the drug's effectiveness decreases after the expiration date, Mylan Pharmaceuticals recommends refilling your prescription before expiration occurs, costing Americans that need the drug on hand at all times a proverbial arm and a leg. As is typical with many medications sold in the U.S., Americans are having to purchase the drug from other countries where it's less expensive such as Canada, where EpiPens cost between $100 and $145, according to reports. Most drugs can be purchased in Canada as long you provide a copy of your prescription online. Families say that they often purchase more than one EpiPen to keep in different places to ensure it's on hand when they need it. "I need at minimum four [EpiPen] two-packs for my son and I like to have an extra two-pack at home," said Susie Mark of White Plaines, New York. She says that even with a coupon, the drugs cost about $500 out of pocket. "I think the next time I do need a refill I would definitely go for a company other than Mylan," said Mark. "I would much rather give my money to another company." It is customers like Susie Mark that Imprimis Pharmaceuticals is hoping to attract with its soon-to-be released EpiPen, which is about $500 less than the one sold by Mylan Pharmaceuticals. This isn't the first time Imprimis has created less expensive drugs, either. Last year, it launched a $1 alternative to Daraprim – an AIDS drug that underwent a 5,000 percent price increase overnight. The drug is made by a company owned by the highly scrutinized Martin Shkreli. Baum says his company is capable of producing cheaper alternatives because Imprimis Pharmaceuticals doesn't have the same overhead costs as major pharma brands. His $52 million company is located in "a modest office park in the outskirts of San Diego and has just 112 employees," according to reports. "By comparison, Mylan is a $23 billion giant with a workforce of nearly 35,000."